Its damned 1.6-liter sounds so raspy choking down desert dust during an uncomfortably hot Arizona December, but if there’s one thing the Rio is any good at, it certainly isn’t exchanging pity as an excuse for mediocrity. Kia instead cashes the small check you send it and returns a machine that inspires the sort of confidence in a driver that belies its Amazon Prime delivery box proportions. It was not surprising, however, that my week with the cheapest car from an automaker known for building cheap cars, started with a groan. We’ll just say this: modernity does not always equate to beauty. Even though the familiar Kia front end looks fresh thanks to eye-popping Azure Blue paint and a closed black grille—the vents lower on the bumper providing the engine with its life-sustaining supply of air—the Rio’s side profile stretches the word handsome and the rear end kills the prospect of anyone calling it pretty entirely. The design changes serve to make it palatable if anything, but to look too far into a Rio’s looks is to miss the point. Groans are what forged this car. You could see them in the sheetmetal if the body seams weren’t so tight. Even though Kia will do anything short of lightning piles of cash on fire to eschew its cheap car image, its success in America was ushered in on the back of budget picks like the Rio. Hate on it all you want, but the only way an auto engineer can make someone fall for a Rio and not sign the paperwork out of sheer economic necessity is to surprise the pants off of them during the test drive. That’s not far from what the Rio did. For the low price of $19,725 including the $895 destination charge and $130 carpeted floor mats—the only option on this Rio EX—this small car packs the combined punch of quality, fuel economy, no-nonsense design, a somewhat intuitive infotainment system, and plenty of fun into a frame spanning 172 inches long and only 68 inches wide. Its back to basics approach has one advantage from the get-go: weight. Coming in at only 2,700 pounds, the Rio doesn’t need fancy suspension, grippy tires, or sophisticated traction systems to be an absolute riot to push to the limit. Steering isn’t as communicative as Ken Block would like it, but it also doesn’t have to be. The intentions of each of the four wheels are conveyed through the seats in such a way that leaning on the brakes—which also rely on the Rio’s relative weightlessness to relay the sense that they are outlying performers—and violently pitching it into a corner becomes an event that awakens the senses and leaves the driver asking for more. Ask for more, as I did during an incredibly busy week where shuttling between family events and a wedding had me in a perpetual state of tardiness, and the Rio morphs into a willing companion along for the ride. With its hands in many fields of expertise, it quickly becomes clear that the Rio is equipped with the sort of versatility needed to handle a life of unexpected happenings—a symptom of those who typically buy the Rio and aren’t concerned with the status and responsibility a car with a more weighty badge would bring. And it’s not because it has everything you’d expect even on the bottom rung of automotive society, like power windows and door locks and a backup camera—this is 2018 for Chrissakes—that the Rio stands out. For that it can partially lay its thanks on the UVO infotainment system. 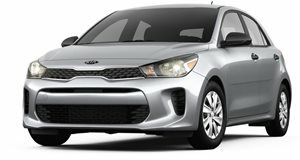 The Kia/Hyundai love child isn’t the most sophisticated thing on the planet, but the ease with which one can shuffle between satellite radio stations and jump back to the map cued up on Apple CarPlay makes it relatively unnoticeable, which is about the best quality one can expect out of these systems nowadays. We’ll put it this way: no fists went flying towards a touchscreen this week. And though autonomous emergency braking and forward collusion warning system does its best to keep outside chaos from immigrating past the walls of thin windows and a stout chassis, the Rio forgoes complexity by not doing things like chirping at a driver at each lane change. Not like computers need to come to a driver’s aid anyways. An expansive greenhouse helps the cabin feel roomy and makes it so that a simple peep over the shoulder is all that’s needed to survey lane-plunging viability—because though the C-pillars run thick with this one, the Rio is small enough that any gulf of sheetmetal that’s relatively large on its body is small compared to just about anything else. The Rio, after all, is a simple car. What you see is what you get, but what you get turns out to be so much more when the silk-smooth gear changes on the six-speed automatic transmission and the pathetic-sounding four-banger makes use of 130 horsepower and 119 lb-ft of torque without letting a single scrap of performance go to waste. Cloth seats never lie to the driver and make them feel more special than they really are, but they’re comfortable enough to make a two-hour road trip feel just as much a part of the journey as the destination. Once that trip concluded, my ride with the Rio was over. I tossed the keys back after driving it into the ground in search of its true soul, but we both emerged from the dust equally ragged, not a single step closer to having reached nirvana, and ready for more.